Come visit, kick back and relax! "Best of Wisconsin" wrote that Hauser’s Bayfield Cabin is one of the 14 Most Romantic Places in the state! This lodging establishment has been host to many honeymooners and anniversary couples. The cabin sleeps two on a very comfortable queen size bed, and another person can sleep on the leather couch and another on the chaise lounger in the living room - or you can go camping / camp out in the yard next to the fire pit or use a blow up air mattress in the living room for your extra guests. The cabin is heated and air conditioned using an eco-friendly geothermal system. We are certified "Travel Green" by Travel Wisconsin. Clik on the "Activities" link to learn more about what you can do in the Bayfield area -- from Legendary Waters casino just a few miles away from the cabin - kayaking to the sea caves (or walking to the ice caves in the winter), sailing, hiking, biking, Apostle Island lighthouse tours and others with Apostle Islands cruise service, beaches at Little Sand Bay, Cornucopia and Madeline Island, berry and apple picking, fishing, cross country skiing, downhill skiing, snow shoeing and much more. 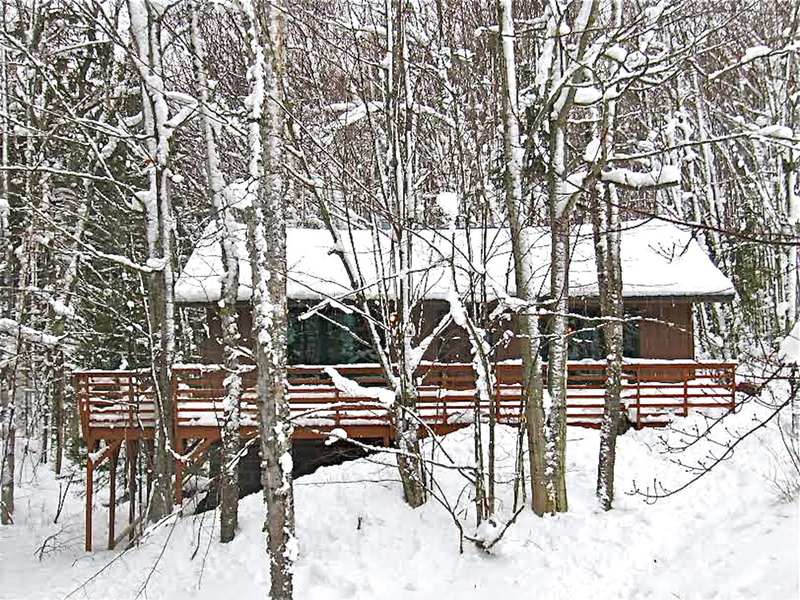 While spring and summer stays are the most popular - the fall and the winter stays at the cabin are simply amazing! 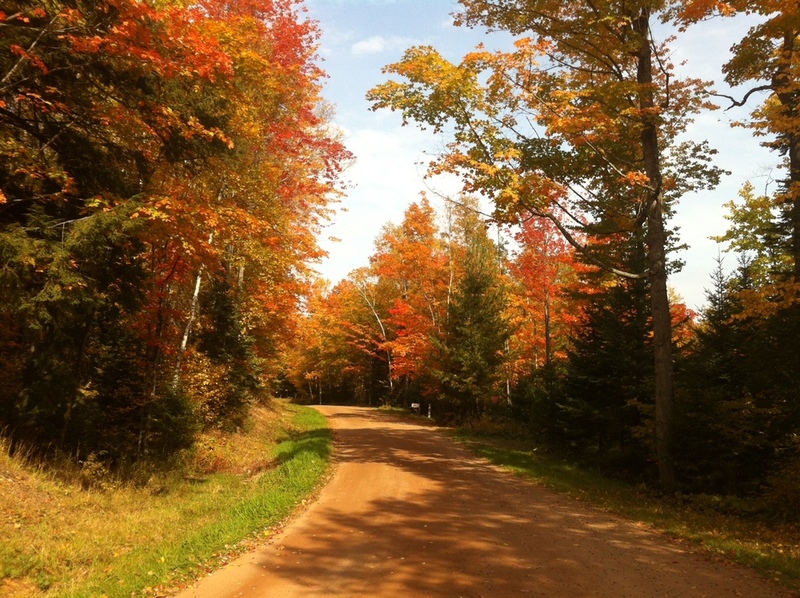 The fall colors are beautiful - as colorful maple and birch trees surround you. In the winter - have a wine toast under the beautiful snow covered pine trees lit with little white lights - for an unforgettable experience! The cabin is located near the highest point in Wisconsin! Just 15 minutes north of Bayfield - the cabin can be your base for exploring the Apostle Islands, the ice caves and sea caves, beaches, sailing, biking, hiking and much more! Bring your dog - as they are part of your family! When you want to get away for some peace and serenity - the cabin is your home away from home. ICE CAVES INFORMATION: We are one of the closest lodging establishment to the world famous ice caves. Being able to walk to them on Lake Superior happens about once every 8 years or so. The last time was in 2014. So maybe in 2022! You an always enjoy my ice cave photography throughout the cabin in front of a nice warm fire. It is truly one of the most romantic times with the beautiful snow scenes and wood stove fires and holiday lights on the snow covered pines. Preferred occupancy is two persons, though two extra people can stay at the cabin, if they don't mind sleeping in the living room. Review: Quiet and romantic getaways. The cabin has geothermal heating for the cooler seasons and air conditioning for your summer visits. We welcome a well-behaved dog or two! We are one of the few lodging establishments in the Bayfield WI area that is dog friendly! Cozy, with everything you need. The living room has great views, comfy seating, an excellent sound system, wood stove, desk, games and books. Perfect for snuggling in. The kitchen has everything you need for meal preparation. You bring the food and don't forget the wine! Just the right size for romance. Gaze at the forest and the stars from the comfortable bed, or watch free movies on the TV. Planning a Honeymoon in the Bayfield area? We've had lots of honeymooners stay! Honeymoon couples receive a free bottle of champagne! Take advantage of all the Bayfield Peninsula, the Apostle Islands, Madeline Island and Lake Superior have to offer: kayaking, sailing, boating, hiking, biking, restaurants, pubs, music, art, many types shops - coffee, sweets (try the amazing wine bread) etc, yoga classes, spas treatments, beaches, sunrises and sunsets... And enjoy foods from the local organic farms and berry fields. Experience the beautiful fall colors, and visit the apple orchards nearby. Many of the spring and summer activities continue into autumn. Come for Bayfield's famous Apple Fest. In the winter - you can enjoy "Book Across the Bay", "Run On Water" and "The Polar Plunge" as part of Bayfield Winterfest. Visit the ice caves, enjoy the dog-sled races in early February, or take a dog-sled trip yourself. You can cross-country or downhill ski, ride a snowmobile, go ice fishing, experience the Madeline Island Windsled, or drive, bike or kite surf the Ice Road.